Is it a plane, is it a bird? Is it a music gig, a music & dance gig, a piece of theatre? Answers to any of the above are almost impossible. 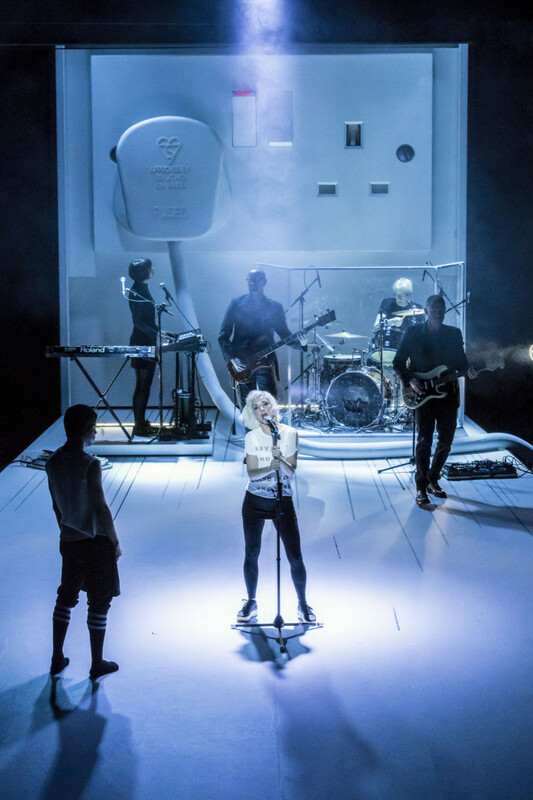 But lift-off there certainly is.Jane Horrocks, as if limbering up for a new career as a post-punk, heavy metal singer has conceived and crafted this wholly unusual hour-long rave in the Young Vic’s main auditorium. And for those who like their music loud and bassist, it’s a gas. I count myself amongst that number even though Joy Division and Morrissey, Buzzcocks, New Order, Soft Cell and the rest were out of my comfort zone and I onlyt caught up with The Smiths when they were being viewed nostalgically. Shows how informed I was/am. But for not the first time, Jane Horrocks confounds expectation. Gamine, with flaming blonde dyed hair and bovver boots, she croons and spits into the mic whilst a bevy of dancers augment her every emotion. Behind her, the four piece band, headed by one Kipper dig deep, Hendrix-like. `What were they on about, those 1976 lot?’ she asks at the beginning. As if answering her own itch, If You Kiss Me, Kiss Me is her `homage’ to that time and growing up with them. Mostly, she reckons they sang of love and it comes in various guises: fast frenetic, dreamy morose, with everything in between. I loved Cabaret Voltaire’s angry, rebellious, crazy Nag Nag Nag as much as The Falls’s surreal My New House with digitalised white lines zigzagged across the floor. Towards the end, Horrocks zooms to the front on a giant white plug pulled from the wall. Horrocks unplugged you might say. I have no idea really how Aletta Collins’ choreography related except to echo Horrocks and show the dancers off in all their suppleness and angst-ridden writhings. They’re terrific. But Horrocks is something else. Backed by the superlative Kipper, electric guitar guru and arranger, she should just forget the rest and reposition herself as the heavy metal singer de nos jours. She’s always had a special voice. This displays it, dynamically, in all its vivid, rich tapestry. Go sample. 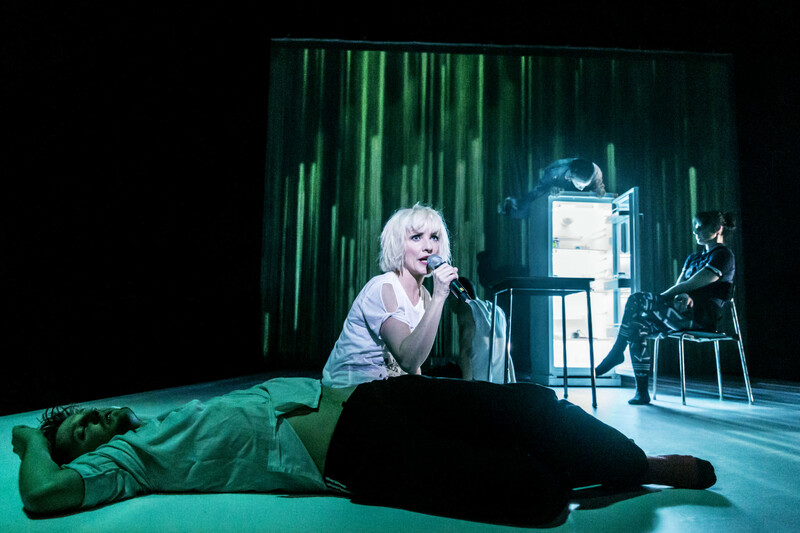 This entry was posted in 2016, Reviews and tagged Jane Horrocks, love songs from the 1970s, music-dance-theatre gig, post-punk musical homage, Young Vic Theatre on March 23, 2016 by Carole Woddis.